Damage to garage and overhead door tracks is one of the most costly and avoidable problems that decrease productivity. When a door track is damaged by a forklift, pallet jack or heavy equipment, the door is virtually inoperable. These damages can cost companies thousands of dollars in lost productivity and energy. Fortunately, PVCStrip.com has a full line of door guards, machine guards and column protectors that prevent damage to door tracks and keep the workflow moving forward. PVCStrip.com’s line of Door track guards mount to the floors and walls around your garage door tracks. They are an inexpensive way to prevent expensive repair. They add a line of protection against costly down time and maintenance. 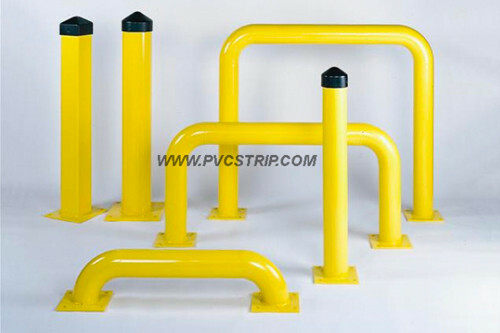 PVCStrip.com’s galvanized steel track guards are available in 36 inch and 48 inch heights and are painted with a yellow finish for high visibility. Their rugged steel design projects 7 inches off of the wall and will help prevent costly service and maintenance calls while extending the life and productivity of your door. PVCstrip.com’s door track guards come in pairs and do not include mounting anchors. PVCStrip.com has a full variety of machine and wall guards for protecting equipment and machinery. If you have any questions or need assistance in protecting your doors and machines from costly maintenance and decreased productivity, contact PVCStrip.com at 888-303-8515. We can also be reached via email by filling out the contact us form.